The RMW compliance rules are both simple and complex and although most are common, they can vary from state to state. Knowing where to turn to in understanding the basics is a priority. The term ‘RMW’ stands for regulated medical waste. It is also known as ‘infectious’ ‘medical’ or ‘biohazardous’ waste and is the type of waste that may contain blood contamination or that from potentially infectious materials or body fluids. 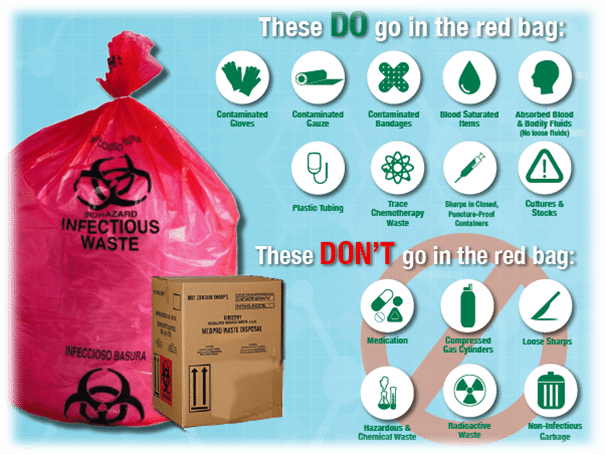 These are the waste types that post a significant risk in infection transmission. There are several factors involved in categorizing waste as the type that is ‘regulated’ and many are controlled with state-specific handling requirements. A majority of the state laws as they relate to RMW are designed so that they are ‘rendered non-infectious’ before they can be disposed of as solid waste. The healthcare sector has unique requirements for RMW and compliance can be both confusing and challenging. Most of the healthcare guidelines are governed by federal rulings, but in the care of medical waste, each state may have differing laws for their waste requirements as well as multiple agencies for compliance. The oddity in this is that laws on the Federal level don’t actually have a very explicit medical waste definition, and thereby the State Departments of Health are in control of the regulations that determine which of the waste types are regulated and those that have special handling. To find out the RMW for each state, use the RMW State locator page, which also contains the individual contact information for the various state agencies in case of interpretation or questions. Almost all states have enacted regulations for medical waste as opposed to waste regulations that are listed as ‘hazardous’; which are governed by the federal RCRA standards. The EPA is no longer involved as a major role factor in waste regulation and instead turns these controls over to the individual states. However, in a majority of states the EPA does carry the primary responsibility for the development and enforcement of medical waste management and disposal and in some states they will work in conjunction with their departments of health. When both agencies are involved it is standard for the department of health to hold the responsibility for on-site management and the EPA is responsible for the disposal and transportation. OSHA Regulations via the U.S. Department of Labor Occupational Safety & Health Administration or the OSHA state programs regulate various aspects of medical waste including the contain requirements, sharps management, medical waste bag labeling and the training of employees. These are standards that are designed for the protection of the healthcare workers so that they are not exposed to blood borne pathogens and to benefit the environment and the public. There may be overlaps between the EPA and state health rules, however there are rarely any conflicts. DOT Regulations are defined by the Department of Transportation as it relates to transporting hazardous materials. The rule for DOT apply mostly to those that transport, rather than the healthcare facilities although knowledge of the guidelines is important to assure responsibilities for liability.